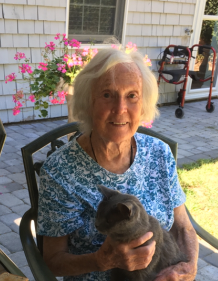 Doris P. Healey, 98, a longtime Seekonk resident, died Monday, the 18th of March at home in Rehoboth. She was preceded in death by her husband Malcolm L. Healey. Born in Providence, she was a daughter of the late Howard W. Pearson and Clara (Butterworth) Pearson. Doris graduated from East Providence High School as class valedictorian and continued her education at Johnson and Wales Business School where she was awarded a diploma. In 1944, Doris traveled to San Diego, California to marry the love of her life, Malcolm, who was stationed there in the Navy. Doris loved entertaining and planning get-togethers ranging from sit-down dinners to backyard picnics. She had many interests including quilting, sewing, traveling, gardening and spending time outside enjoying nature. Doris leaves her brother Robert G. Pearson and his wife Patricia of Rehoboth and several nieces, nephews, great-nieces and great-nephews. She was predeceased by her sister and her brother-in-law, Helen and Channing Dupouy. A private graveside service was held in Thomas Cemetery, North Swansea. Calling hours have been respectfully omitted. Arrangements have been entrusted to J.H. WILLIAMS & CO. FUNERAL HOME, 210 Taunton Avenue, East Providence. J. H. Williams & Co. Funeral Home 210 Taunton Avenue East Providence, RI.